Statistics from the South Dakota Department of Transportation indicate an average traffic count in Sturgis of 64,026 plus per day during the official week long reporting period. Respondents to a survey indicated that www.SturgisMotorcycleRally.com is their #1 go-to source for information on the Sturgis® Motorcycle Rally™! How can you capitalize on this phenomenon and capture the attention of this market? Sturgis® Motorcycle Rally™ sponsorships offer you customized packages that combine a unique blend of on-site visibility and promotion during the Rally itself, as well as year round exposure through the Rally's official website and related promotional vehicles, in order to establish top of mind awareness for your brand with Sturgis® Motorcycle Rally™ attendees. 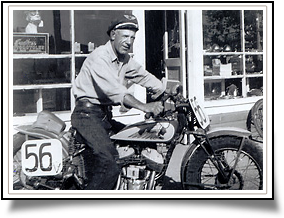 When Clarence "Pappy" Hoel purchased an Indian Motorcycle franchise in the depths of the Great Depression, he had no idea that he was about to begin the most famous motorcycle gathering in the world. It all began in 1938, when Pappy, his wife, Pearl, and his newly founded Jackpine Gypsies Motorcycle Club decided to host a race in Sturgis. Nine participants and a mere 200 spectators attended. Today the Sturgis® Motorcycle Rally™ is one of, if not 'the' largest gatherings of motorcycle enthusiasts in the world. The Rally occurs every August in the Black Hills of South Dakota, home to Mount Rushmore, Crazy Horse National Memorial and Devil's Tower Monument to name a few of the area's most recognized 'icons'. The 2017 Sturgis® Motorcycle Rally™, August 4th - 13th, celebrates the 77th Anniversary of the event that has become known to motorcycle enthusiasts throughout the world as the "Granddaddy of 'em all". Attendance for the 2013 Sturgis® Motorcycle Rally™ was estimated at 467,338 with participants from all 50 states as well as Canada and dozens of other international communities including Japan, Australia, Germany, England, etc. From South Dakota’s Governor, to entertainment and sports superstars, to motorcycle industry legends, you’re likely to find them all strolling Main Street and enjoying the sights and sounds that are "Sturgis"!